Although pads or diapers may prevent embarrassing leakage, other urinary incontinence treatments currently available can eliminate your need to wear such protection. The options listed here are good ways to start taking control of your bladder. If you have urinary incontinence you may need to keep track of the fluids you drink. You may need to reduce your intake of caffeine or other drinks that irritate the bladder. These include some fruit juices, colas, coffee and tea. You should also increase your water intake. This helps to produce an adequate amount of non-irritating, diluted urine. Six to eight glasses per day is a recommended water intake. A bladder diary is the starting point for bladder training. You write down your fluid intake and urination times. You also record when urine leakage occurs. If you are someone who urinates infrequently, this information will help your health care provider instruct you to do “timed urination.” This is a way of learning to urinate every one to two hours while you are awake. With regular bladder emptying, you should have fewer leaks. Timed urination may help with both urgency and stress urinary incontinence. If you urinate often, you may benefit from retraining your bladder. The goal of retraining is to increase the amount of urine that you can hold within your bladder. You keep a bladder diary to write down how often and when you urinate. You gradually increase the time between urinations by 15 to 30 minutes per week. The goal is to have you urinate every two to four hours while awake with less urgency and less incontinence. Known as Kegel exercises, these exercises can help strengthen the external sphincter muscle and the pelvic floor muscles. If you are able to contract and relax your pelvic floor muscles, you can improve their strength by doing the exercises regularly. The contraction of the pelvic floor with the Kegel exercise can interrupt a contraction of the bladder that would otherwise trigger the urge to urinate. This may stop or delay leaks. You may need help from a health care professional to learn how to contract these muscles. Whether you have stress incontinence or urgency incontinence, you will benefit from Kegel exercises. Like any fitness program, you must continue to do the exercises to maintain their benefit. Drugs that tighten the bladder neck can also treat stress incontinence. The decongestant pseudoephedrine causes constriction of the blood vessels in the nose. It also causes the muscles at the bladder neck to contract, helping to control bladder leakage. If you have a history of high blood pressure please discuss this option with your physician. Anticholinergic drugs can treat urgency incontinence. They allow the bladder muscle to relax. These drugs work well to treat urgency incontinence but may have side effects. These may include dry mouth, confusion, constipation, blurred vision and an inability to urinate. You may also be using other medications that cause the bladder muscle to relax or the smooth muscles at the bladder neck to contract, so you should mention these to your health care provider. If you have incontinence after menopause, you may benefit from hormone treatment. Hormone replacement may improve the health of the bladder neck and urethral tissues. This may help incontinence symptoms. There are some medical reasons not to use hormones. Speak to your health care provider about the best treatment options for you. All therapies mentioned can improve incontinence but may not be a cure. Improvement may take a while and it takes time to learn new 6 Abdomen Also referred to as the belly. It is the part of the body that contains all of the internal structures between the chest and the pelvis. Some patients may notice an immediate effect with medical therapy. Others may not see improvement for up to four weeks. Urinary incontinence may also recur after treatment. These include regular urination, pelvic floor exercises, avoiding constipation, avoiding bladder irritants and drinking enough water. If you have urinary incontinence, talk to your health care provider. It may be necessary for you to see a urologist who specializes in treating this condition. You can help your doctor by bringing a list of your medications to your appointment. You may want to record the amount and type of liquids that you consume, the number of times you urinate and the number of leaks you had for two to four days before your appointment. 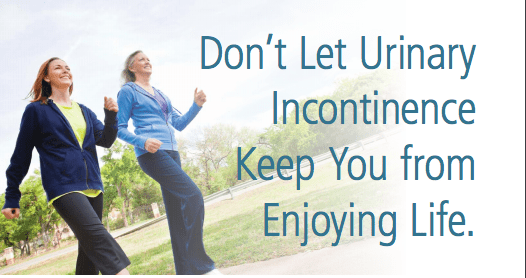 There is help if you have urinary incontinence.